Hills Comes Home by Charese Cunningham – Half Hollow Hills Teachers Association | Love what you do. Saturday October 20, 2017 was unlike any other Saturday for the Hills community. Unseasonably warm, the air was crisp and alive with anticipation. Music filled the air. Members of the community lined the area in front of and around our schools. Everyone was eagerly awaiting the annual homecoming parade and football game. Colorful floats with beautiful displays, the marching band in full uniform, the Cheerleaders, the Dixettes, clubs and a stunning homecoming court, progressed along the parade route. Attendees cheered loudly and snapped photos as the parade went by making their way to the football field. This day served as a time for the community to come together, show their school spirit and encourage the home teams. 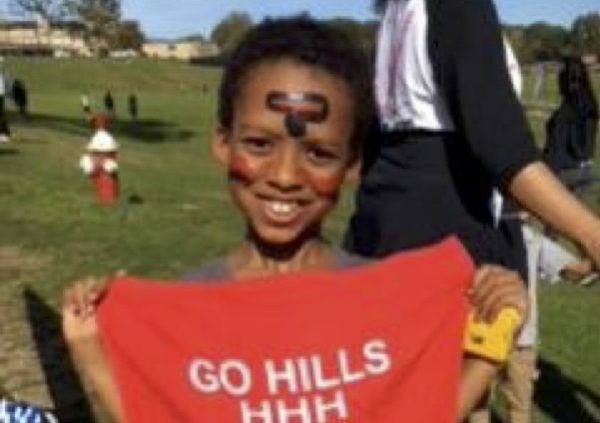 The crowd cheered the players as they ran onto the field and rose to their feet throughout the game cheering and waving their red Half Hollow Hills towels provided by the HHHTA. Alumni returned to support their high school teams, reconnect with friends and catch up with faculty and staff that instructed and guided them throughout their high school career. Several HHHTA members, nominated by the student body, received recognition during half time for their guidance and leadership.